The Wild Wadi Water Park is situated in Jumeirah, an area in Dubai, United Arab Emirates next to the Burj Al Arab and the Jumeirah Beach Hotel. 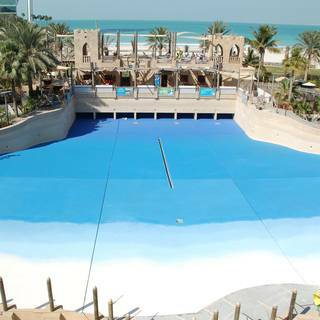 The water park is operated by Jumeirah International, a Dubai-based hotelier. By applying different blue shades in special mixtures and techniques a colour gradient was achieved that gives the impression of great depth. Beside the optical aspects the waterproofing and the resulting resistance against detachment problems was of further importance. Additionally the UV resistance under the arabic sun was a request.